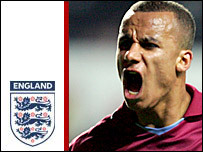 Aston Villa striker Gabriel Agbonlahor has been included in the England Under-21 squad for the friendly against Romania at Ashton Gate on Tuesday. The 20-year-old missed the European Championships in the summer when boss Stuart Pearce could not contact him. That angered Pearce but, following recent talks with the striker, he appears to have forgiven him. Agbonlahor could have applied to play for Scotland and Nigeria, who both expressed an interest. Pearce has named eight new faces in his squad - his first since taking the manager's post full-time. Martin Cranie, Craig Gardner, Michael Mancienne, David Wheater, Michael Kightly, Fabrice Muamba and Dexter Blackstock all get their first call-ups. Arsenal forward Theo Walcott is also included after missing England's run to the semi-finals of the European Championships with a shoulder injury. Newcastle defender Steven Taylor has been named in the senior squad for the friendly with Germany and will not feature. Alnwick (Tottenham), Hart (Man City), Cranie (Portsmouth), Gardner (Aston Villa), Mancienne (QPR), Onuoha (Man City), A Taylor (Middlesbrough), Wheater (Middlesbrough), Huddlestone (Tottenham), A Johnson (Middlesbrough), M Johnson (Man City), Kightly (Wolves), Milner (Newcastle), Muamba (Birmingham), Noble (West Ham), Agbonlahor (Aston Villa), Blackstock (QPR), Derbyshire (Blackburn), Moore (Aston Villa), Walcott (Arsenal).